Once I get the notion that I want an item, it turns into an unyielding mission that I focus on, probably too much. When the notion arose for a secretary desk, it was no different. I longed for one, preferably one I could paint. However, when the initial search began, my heart quickly dropped upon seeing the average price of one. Whether it was an original, with no work done on it, or one someone had “shabby-chiced,” (I know that’s not a word) the prices were, well, crazy, to be honest. Most I found, online or in person, were $300-600. Cue cartoon me with my eyes popping out of my head and jaw dropping to my feet. 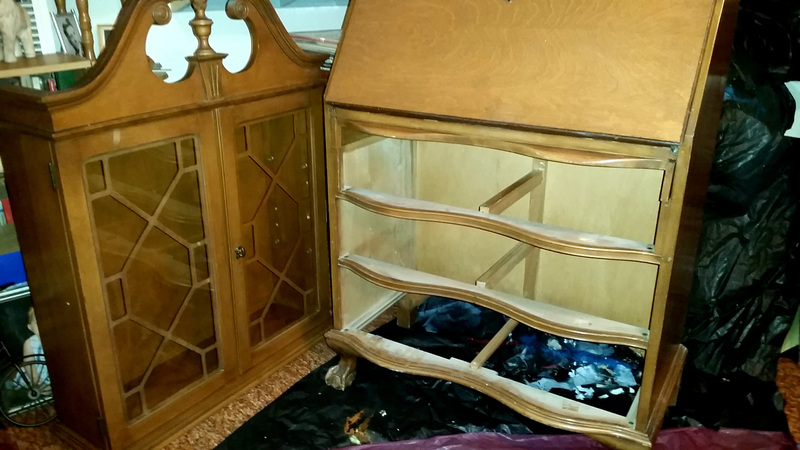 While one without the hutch on top would have been okay by me, they were still at least $200. This mission proved to be a difficult one, but I vowed not an impossible one. All the ones I found in person were of course, pricey, but I kept looking. I finally found one, a beautiful, well-kept one for $235, hutch and all. It was still more than I wanted to pay, but compared to all the rest, it was doable. However, it was so beautiful as it was, if I decided to buy it, I could never bring myself to cover it in paint. I left the antique store with a card, so I could call and put a hold on it if I decided I wanted it. So the mission was kicked into high gear, red alert. I scoured Craigslist, not just the San Diego listings but Orange County, Los Angeles, and Inland Empire. My phone screen penetrated my eyes and posting after posting was emblazoned upon my brain. I’m surprised I didn’t go cross-eyed due to how much I was looking at Craigslist ads for the next 24 hours. Then *gasp* there it was. 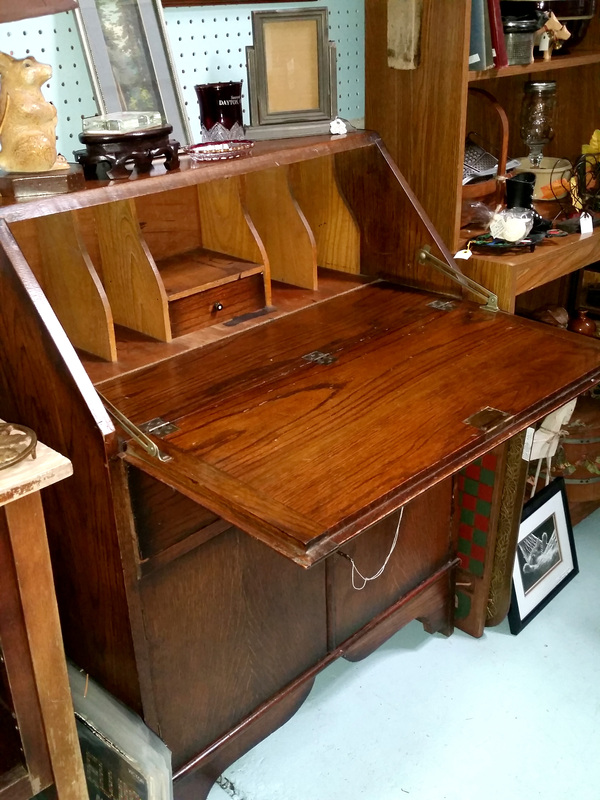 An ad for a secretary desk with hutch, in two pieces, with minor wear, for $120. Could it be true? Was it still available? My fingers could not type fast enough to send the message. It was and I had first dibs on it. It was somewhere east, a place I had never heard of about an hour and a half away. I borrowed an SUV and made the drive out to look at it, and it was perfect! It was exactly the style I wanted and it was in good shape but worn just enough and not the nicest of finishes as to make painting it okay. The people from whom I bought it were the nicest people, and took the two pieces apart to make loading it easier. They even helped me load it into the SUV, and thank goodness I had that, because it was a tight fit even with all that space. No way it would have fit in the trunk of my small car. It all came together impeccably, like it was meant to be! When I got it home, my living room was turned into a workshop and drop cloths were placed on the floor and over any nearby furniture and shelves. I had never used chalk paint before, but I read enough articles and tutorials that I figured I couldn’t possibly mess it up. So I dove right in and the painting commenced. 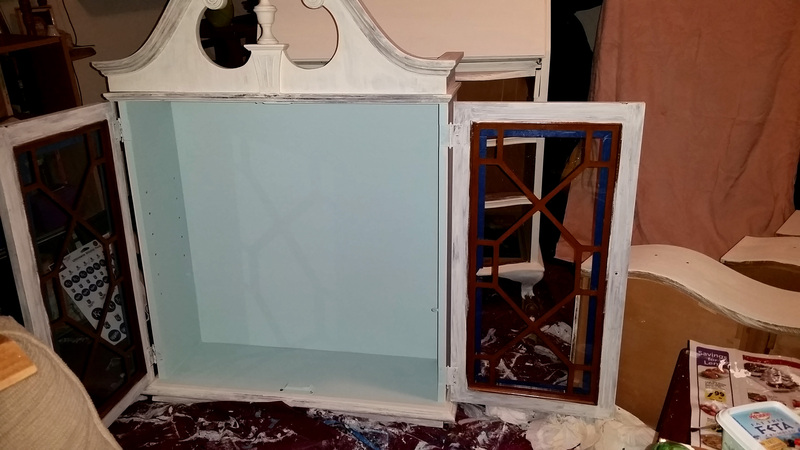 I mixed Annie Sloan Old White and Provence to make the color for the inside, and used Old White for the outside. Admittedly, I ran out of Old White, and finished with some brand of chalk paint from Michaels. I actually had to mix two different shades of the brand at Michaels to get the Old White shade. However, doing this turned out to be fine, and I couldn’t even tell the difference in colors. I applied several coats over about a week as I wasn’t going for the shabby-chic or worn look. When I was satisfied with how it looked, I applied several coats of wax, and voila! The only iffy part was the lattice on the glass of the doors. 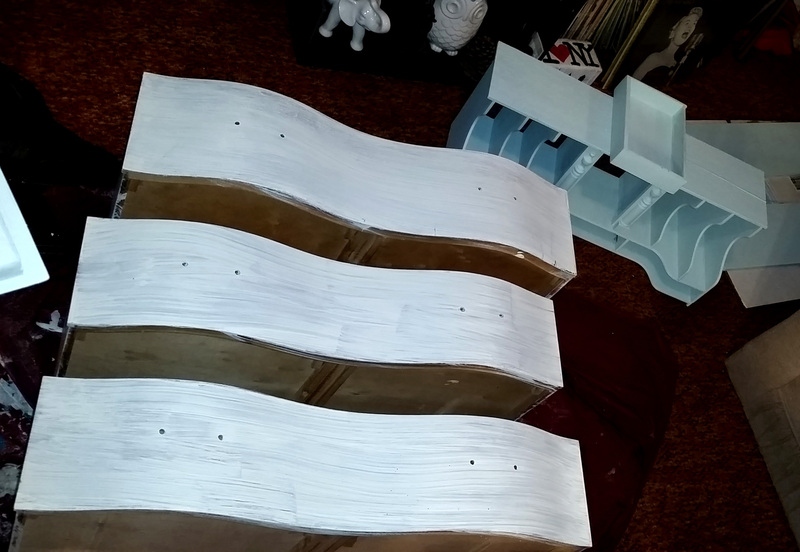 Seeing as it is on the inside, there wasn’t anything I could do about painting them so they remained the wood color. I thought perhaps they could be removed and put back in, but as I am no expert, I wasn’t going to take the chance of completely destroying them. I’m sure my Dad, who is in fact an expert at such things could have accomplished this, but 1600 miles keeps us from finding out. Pulls? I don’t need no stinking pulls. . .oh wait, yes, yes, actually I do. All that was left was to load it up with something. I decided books looked good in the hutch part, and the drawers provided a ridiculous amount of space for a variety of things. 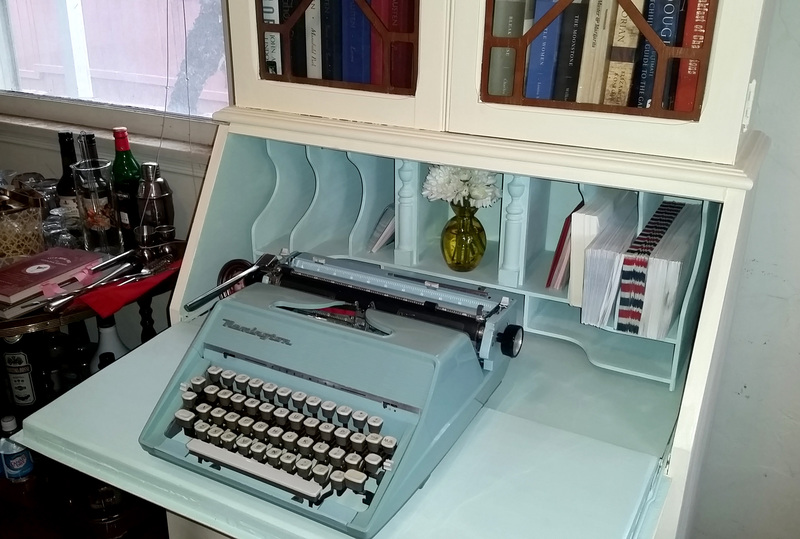 It wasn’t even my intention for it to so closely match my typewriter, but it worked out nicely. Eventually, I also found an old vanity stool that looks like it was made for it. And here she is today in all her glory. Quite lovely, if I do say so myself. My letter writing, envelope addressing, and random jotting down all have been made even more enjoyable with this exquisite space at which to work. Glad to jog the memory! Even if you don’t actually buy one, they’re fun to just look at. There are some beautiful items, thank you for sharing.